I approach this review with a bit of difficulty. I need to describe the premise of this game, but after hearing it you might be inclined to just ignore the rest of the text. I’ll just dive right in, and hopefully you stick around. In Do Not Fall you play as Pipi, a bunny with a blue mohawk who lives in a vending machine. You are tasked with the glorious mission of finding the ingredients to make the various beverages in the machine by exploring the odd and dangerous dimensions that exist within. Exploring these worlds consists of dodging the various creatures and obstacles that impede your ever-crumbling path. Seriously. Bunny in a vending machine. This takes place inside a device that dispenses chocolate milk. Each of the game’s levels is a mad dash over platforms that are constantly crumbling underfoot and regenerating. As you traverse these treacherous walkways, you can collect various items that rewards going off the main path. Silver nuts increase your score and let you buy things from the shop, golden bolts help to unlock new stages, and keys are typically necessary to finish the level at all. You can jump, of course. Hopping around is a necessary skill in any platformer, and the jumps in this game are carefully plotted to make sure you are utilizing all of your skills and range in that regards. You can also dash, which allows you to break down barriers, move quickly, and jump extreme distances. The dash move is on a brief cooldown, so players will sometimes need to carefully watch their usage of the power. All of those pink blocks? They all break apart once you step on them. Mastering your basic movement abilities is necessary early on. Very quickly, the game will begin to throw various obstacles at you to try to knock you off the platforms. Spiked balls, tropical birds and eagles, permanently disappearing platforms, falling volcanic rocks… The list goes on and on. All the player needs to be aware of is that there is nothing in this game to help you. And as the stages grow more complex and the path more dangerous, players will need to employ real strategy and skill to clear stages. Some levels will have a particular path that the player will need to take, and some are slightly more open-ended. Either way, most players will find their playthroughs of the game largely identical. There is little replay value to be had, unless you are looking to gather all collectibles and complete all alternate objectives. However, I feel confident in telling you that it probably won’t be that desirable an option. The game also has various online multiplayer modes to dabble in, but they don’t matter. Note that I’m not claiming their lack of importance is due to them being not fun. I’m saying this because I never got a chance to play them owing to the fact that the install base of this game is so low that you’ll never see an online lobby open up. It’s a veritable dead zone out there. I never got a chance to see what these modes were like. Though Do Not Fall is a quirky title, it does have it’s share of valid challenges for platforming fans. However, the lack of polish and monotony of the game is a bit hard to forgive. I cannot remember any one distinct level, because they all just blur together. There is nothing necessarily creative or innovative done here on a stage-by-stage or even overall basis. It feels like user-generated content in a game that gives you a level editor. 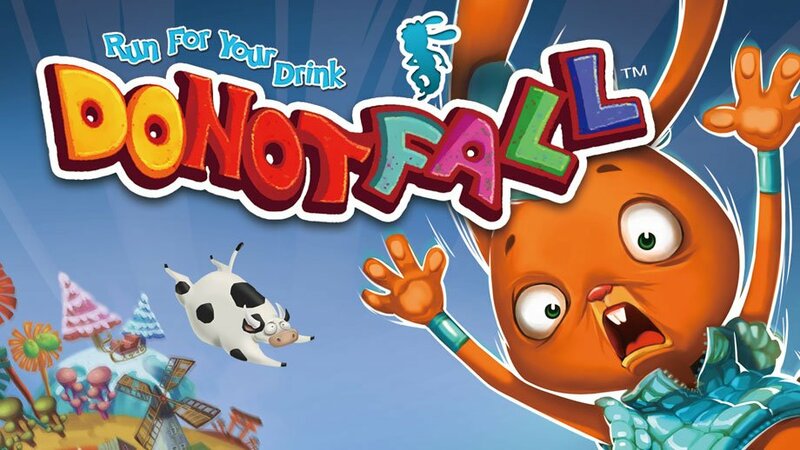 For all of its shortcomings, Do Not Fall can make an argument as a fairly solid platformer. But the glaring omissions of creativity and charm make this a mostly bland experience. It is also extremely disappointing from a player perspective to have an online mode that is rendered largely unusable due to a lack of global players. If you are looking for a quick challenge, Do Not Fall might suit your needs. Just don’t walk in expecting something that’s completely satisfying. Note: Screens used for this review were taken from the developer website. However, these were not taken in game, as the game has a fixed overhead camera angle. These are screens of actual gameplay and levels, just not from the perspective a player would be viewing them at.